There are certain toys that need lot of imagination and construction like the LEGO toys. But there is another brand called Nanoblock, which is a series of theme based construction toys, manufactured by a Japanese company, Kawada. Nanoblock has a wide and large network base, and the toys in this brand are being exported to 31 countries from Tokyo, Japan. 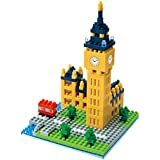 Just like, a building or any other physical structure is made in the real world through bricks, nanoblock play sets involve the construction of toy structures, using ABS plastic made small brick pieces. These brick pieces are the building blocks of the final toy structure to be built. These small block pieces are three dimensional having approx size as 5mm * 5mm * 5mm (though size of pieces may vary according to the set) . There are only total 11 brick types used in the creation of all the models of nanoblocks. Here is a nice video showing the creation of Big Ben model through the small pieces. Till date, Kawada (Japanese company) has come up with four series in its line of production. These series can be distinguished, by the range of number of block pieces used, to make the toy sets and theme. The four series are "sights to see series (200-600 pieces)", "wedding and birthday series (aiming girls-980-1200 pieces)", "the miniature collection series (80-150 pieces)" and "the advanced hobby series (more than 2000 pieces)". There are different toy sets available in each series. The price of each set will depend on the number of pieces involved, and how complex the structure is. The "miniature collection series" involve the construction of figures of animals, musical instruments, and Christmas theme. These toy sets are the cheapest as they need less pieces of blocks to build. I consider best and most exciting series as the "sights to see series", which involves the construction of some of the best, and most famous architectural structures of the world, like Sydney Harbour Bridge (in Sydney, Australia), Big Ben (clock tower in London), Tower of Pisa (freestanding bell tower in Italian city of Pisa), Louvre Building Sets, London Tour Bus, Taj Mahal (in India-one of the seven wonders of the world) etc. "The advanced hobby series" is meant for bigger projects, and involve more than 2000 block pieces to be assembled. This series is really challenging and involve the creation of big structures like Statue of Liberty, Titanic, different airplanes, human skeleton, Tokyo tower, Pirate Ship, steam locomotive, shark submarine and more. This is highly complex series, and basically meant for elder people, though children can also try their hand on the creation of toys in this series. As the name implies "wedding and birthday series" is basically meant for girls, and involves the creation of toy sets like birthday cake, baby stroller, wedding figures, love and romance heart, draft beer and more. All the four series are good enough to make your child extremely busy with the creation, and thus enhancing the building, planning and organisational skills. Also, all the plastic made block pieces are environmental friendly, as the Nanoblocks are coloured, using soy ink, rather than, petroleum-based products. Nanoblocks have gain the popularity all over the world, as these are liked most by the kids, and that is the reason these are being exported to more than 30 countries. The company has distributors all over the world.